by Bill Dwight on Tuesday, December 11, 2012 at 3:42 PM | LEAVE A COMMENT! Last week, Dan Kadlec invited me to chime in on the “allowance debate” for his article in TIME Business & Money:Kids and Allowance: The Debate that Divides Us. I was honored to be included alongside some of the most prominent names in personal finance (Suze Orman, Dave Ramsey, Jean Chatzky, Janet Bodnar), and I was relieved to be grouped in the “thoughtful” corner (I can just see my kids rolling their eyes now). I find the allowance debate to be a diversion. To me, the far more crucial thing is practice — early and often. I think it’s critical for parents to make sure their kids get regular hands-on experience making real spending, saving, and giving decisions with a modest, constrained supply of their own income. I don’t think the specific source of that income (unconditional allowance, chores, outside jobs, or a hybrid thereof) is hugely important — as long as it’s thoughtful, consistent, clearly communicated, and in line with the family’s values. Furthermore, the appropriate source and amount of that income varies with age. As kids mature, they can manage spending for more than just little occasional “wants” and start tackling budgeting and expense tracking for specific needs — like clothing. Over time, they can also be expected to kick in more and more income on their own from outside work. My bottom-line advice to parents: don’t let agonizing over the allowance vs. chores debate get in the way of getting your kids started with hands-on money practice — pick an approach, get started, and tweak it over time. Beyond the compliment of being included, I was particularly pleased to see Dan cast a critical eye on the Mandell research that purportedly shows an inverse relationship between receiving an allowance and developing financial aptitude. The less discerning journalists tend to just run with a link-bait headline like “Allowance Does More Harm Than Good” and then couple it with a fluff piece sans any meaningful analysis. A more accurate headline that more closely matched the findings would really read something like: “Thoughtlessly forking over an allowance with no discussion or guidance probably won’t teach your kid good money habits.” No, duh. My feeling: Allowance isn’t the problem, but parents might be. 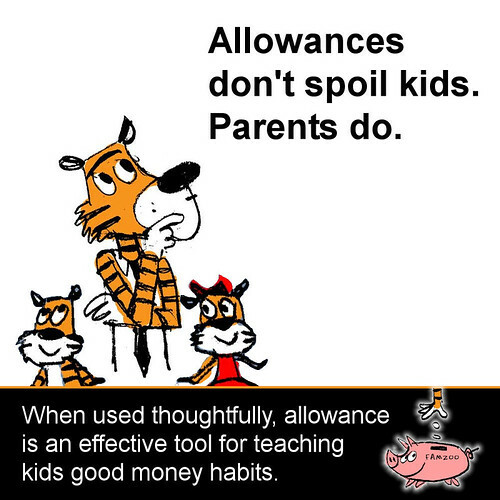 Allowance is just one simple tool (among many) that parents have at their disposal. If parents are thoughtfully delivering a modest allowance as a way to give their kids regular practice managing a constrained financial resource (also know as operating within a budget), I can’t fathom how that would inhibit the development of their financial aptitude. If the “research” shows otherwise, I’m inclined to think there are other factors at play that are skewing the results (see section 2 of this post for more thoughts on such studies). Dan Kadlec covers all the “expert” (present company excluded!) 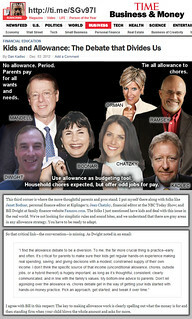 angles on the ever polarizing allowance-for-kids debate: no allowance ever vs. pay for chores only vs. allowance as a budgeting tool.